Situated on the first floor of the beautiful St. Regis Abu Dhabi, this traditional Italian eatery oozes class and authenticity from the moment we walk in. It’s a Saturday evening when we visit, and the UAE winter winds are in full swing. We opt for an indoor table in the restaurant’s conservatory, meaning we unfortunately miss out on the Corniche views that are visible from the terrace – but these are a must-see when the weather is nice! An aristocratic-themed décor style flows throughout the restaurant, and the dark furniture, large beige armchairs and marble mantlepieces add to the wintery feel of the evening, and that’s even before we get stuck into the food! Many of Villa Toscana’s dishes on the à la carte menu hail from traditional Tuscany-inspired recipes, including Ribollita soup – a popular winter dish with cabbage, beans, onions and carrots, and Bistecca di chianina Fiorentina – beef steak typically cut from Chianina cattle, seasoned with local spices, and grilled over red-hot coals. Spoilt for choice, we opt for the burrata and spicy prawns to start. The burrata is served with beautifully fresh tomatoes and an emulsion of basil pesto which packs a ton of flavour, while the prawns arrive at the table in a sizzling ceramic dish with a hearty helping of warm focaccia bread to soak up that oh-so-delicious garlic sauce. For mains, I choose the chitarrucci served with tomatoes, king prawns and lobster sauce, while my dining partner tries the beef agnolotti vaccinara, filled with porcini mushrooms, Castelmagno cheese and pistachio grains. 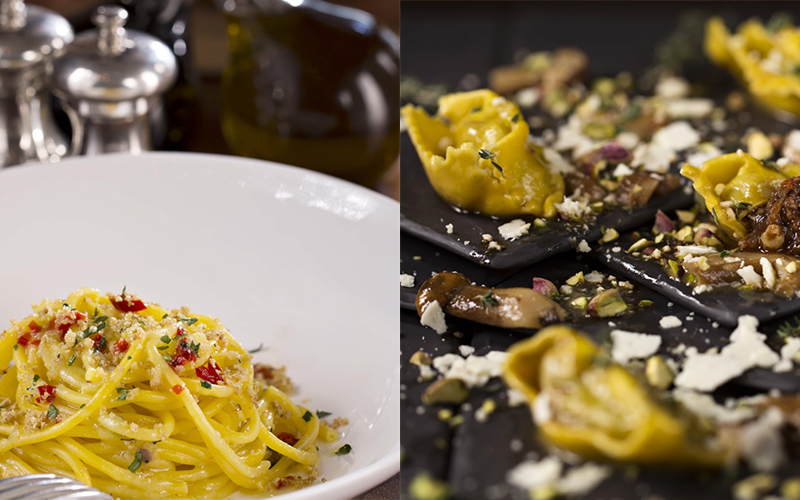 Traditionally, pasta is served after the aperitivo and antipasto as the “primo” dish – meaning first course in Italian. If you’re planning to follow the traditional five-course custom when visiting Villa Toscana, be warned; the pasta portions are not small! My dish features a generous helping of meaty king prawns in a rich, flavoursome sauce, while the beef agnolotti is melt-in-the-mouth and the definition of comfort food; a must-try! Unable to manage a “secondo” course, though the choices look divine, we head straight for dolce. Italian desserts are a personal favourite of mine, so be sure to try the traditional Tiramisu and chocolate fondant for a real taste of la dolce vita! A taste of traditional Tuscan food with great views of the Corniche. 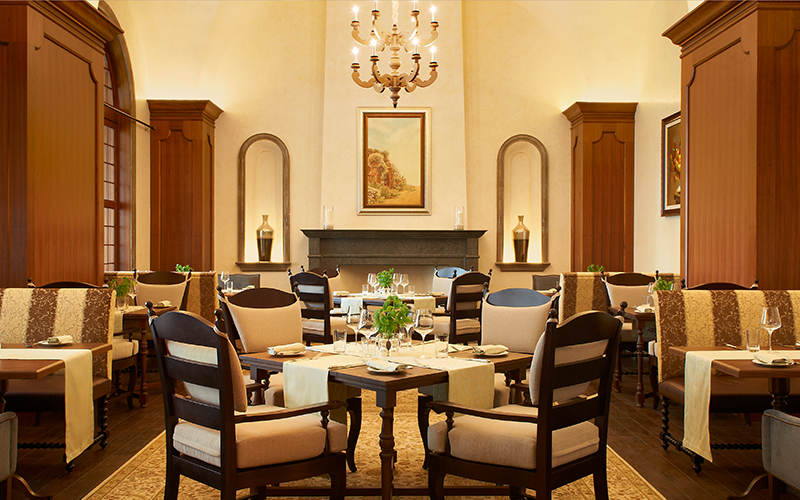 Villa Toscana also hosts a weekly Saturday brunch from 12:30pm-4pm, serving up Italian favourites such as homemade lobster and prawn ravioli, and grilled rosemary and mint lamb rack. There’s also a dessert buffet and an Italian cheese corner, with prices starting from AED 210 per person. Details: Priced at approximately AED 350 per person for three-courses without beverages. For reservations, call 02 694 4553 or visit villatoscana-abudhabi.com. If you enjoyed this article, you may be interested in reading more of our restaurant reviews here.